Habitat: Temperate regions of the Northern Hemisphere. It grows on higher altitudes, on grassy areas in highlands. Description: Clubmoss is a low-growing, creeping, evergreen plant. It has dense spirals of bright, yellow-green leaves and a 1 meter long stem that sprawls on the ground. Spores are produced in two to three cylindrical cones. They are collected in July and August. Useful components: Alkaloids, flavenoids, polyphenols, triterpenes. Medicinal use: Traditionally Clubmoss was used in treatments of kidney stones, urinary tract infections and digestive aliments. Today, the plant is considered to be an antispasmodic, diuretic and sedative. Also, it reduces gastric inflammations, eases digestion and helps in treatments of chronic kidney disorders. Its spores, dusted into powder and applied on the skin could ease skin irritation and itching. 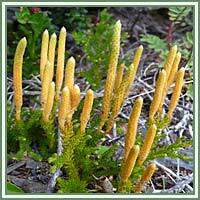 Clubmoss is used in homeopathy for treatments of aneurisms, constipation, chronic lung and bronchial disorders, fevers. 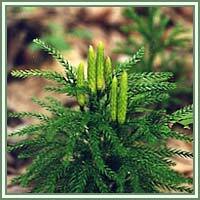 Safety: Clubmoss can be toxic if taken in high doses. Always use the plant under the supervision of a professional.